Just two points separate Valentino Rossi (195) and Maverick Viñales (193) for third in the standings. Marc Marquez’s title is secured while Andrea Dovizioso holds the tiebreaker should Rossi match him at 220 points. There’s teammates Valentino Rossi and Maverick Viñales battling for rear grip and third place; we’re picking Rossi, who can do more with less than Viñales. You’ve got Álex Rins, Johann Zarco and Danilo Petrucci locked in an interesting joust for fifth which Rins will win, setting off a mild celebration in my kitchen. Alvaro Bautista may be auditioning for 2020. Franco Morbidelli appears to be a lock for Rookie of the Year. And guys always want to win races, so there will be plenty of hair-raising action, if not as much urgency. Still, at 180 mph, it’s never really dull. Marc Marquez received a hero’s welcome in his hometown of Cevera, Spain. With three classes competing, and a dizzying array of sub-championships to be awarded – team, constructor, color scheme, catering, brolly girls – trying to provide an overview would turn this into a term paper. As we used to claim in grad school, giddy, smugly, “Such questions are, unfortunately, beyond the scope of this paper.” Look ’em up and share with the group. Marc Marquez stayed on Jorge Lorenzo’s tail for much of the 2015 race in Valencia but never seriously challenged him. No one who reads this stuff is likely to forget the 2015 season finale, at which Jorge Lorenzo won from pole while his loathed championship rival and “teammate” Rossi, having been penalized for his encounter with Marc Marquez in Sepang two weeks prior, was forced to start from the back of the grid and could only (only!) make his way back to fourth place at the finish. There was additional controversy as to why the Repsol Honda team, especially Marquez, appeared to ride as wingmen for Lorenzo, never seriously challenging him over the last few laps. Rossi fans will never get over 2015. And so it goes. When you realize too late the party had a dress code. Dani Pedrosa last tasted victory in last year’s Valencia race. 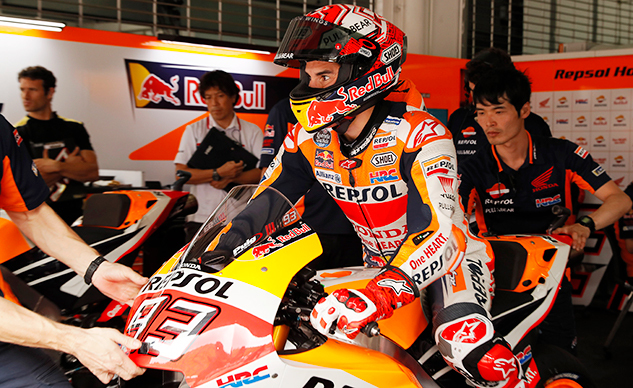 Dani will be a sentimental favorite to do it one more time this weekend in what will be his final MotoGP race. Constantly looking for ways to shore up my passive-aggressive support of Álex Rins and Suzuki, I thought we could take a look at point totals since the cluster at Silverstone. I’ve taken the liberty of removing Marquez and his 120 points from the mix to add to the illusion. In the six rounds since the cancelled Silverstone race, Álex Rins has been entrenched into the top six including two podiums. Dani Pedrosa may be retiring from racing but he still has a lot of work ahead of him as KTM’s official testing and development rider. If it turns out to be wet race, then why NOT Hafizh Syahrin? Since Dani Pedrosa entered MotoGP in 2006, he and Valentino Rossi have combined for 67 wins and 127 podium finishes. Here’s hoping these old dogs will battle it out one more time. We’ll return Sunday with results, analysis and epilogue. BTW, I peeked at the 2018 Season Preview, preparing for the 2018 Report Card, and found myself to be pretty much dead on with the notable exception of #26, who wrecked my bracket. Otherwise, had it pretty much nailed. Lorenzo DNFs and DNSs killed his season. Petrucci won his factory seat for 2019 and nothing else afterwards. Whatever. Plenty of good reasons to watch the race on Sunday and argue about it here.